Featherwing beetles are smaller than the period at the end of this sentence. They get their name from the feathery fringe on their wings that enables them to catch the air and float like dandelion seeds. And, it turns out, they go way back– scientists discovered a 99-million-year-old featherwing beetle preserved in amber, and they named it "Jason." "This tiny beetle lived during the Cretaceous Period, it saw actual dinosaurs," says Shuhei Yamamoto, a researcher at the Field Museum in Chicago and co-lead author of a paper describing the beetle in Cretaceous Research. "The amber the beetle was found in is like a time capsule." The new beetle, the earliest member of its family to get a scientific name, is called Kekveus jason. "Jason" is a reference to the Greek hero who sailed the world in search of the Golden Fleece; "Kekveus," meanwhile, doesn't mean anything–co-lead author Vasily Grebennikov of the Canadian Food Inspection Agency, picked it because new genus names for little-known fossils often wind up changing when the species is later reclassified as scientists learn more about it. "From my perspective I always believe that an animal name should not have any meaning (except when named after a person), since if the authors are wrong, it might be odd to have later species 'chinensis' endemic to Europe, or something similarly absurd," says Grebennikov. Yamamoto discovered the tiny sailing insect by poring over pieces of amber. Amber is made from fossilized resin, a sap-like substance produced by plants. When prehistoric insects got trapped in resin, their bodies would get incorporated into the amber that formed–think the mosquitos from Jurassic Park, minus the "resurrecting dinosaurs" part. When Yamamoto spotted a tiny black speck in the amber, he was cautiously optimistic that he'd found a prehistoric insect. "I didn't have much confidence at first, but after cutting and polishing the amber so I could get a better look, I realized, oh, this is truly an amazing fossil," he says. The beetle is only 0.536 millimeters long–it's dwarfed by the tip of a mechanical pencil. But under a microscope, Yamamoto was able to glean details of its anatomy that revealed it as a different species and genus from living featherwing beetles. For instance, it has three grooves running like pinstripes up its body, a feature not found on its modern cousins. Overall, though, the researchers found that K. jason has a lot in common with featherwings alive today, meaning that the family of beetles evolved features like a tiny body size and fringed wings millions of years ago. According to Yamamoto, amber fossils yield a level of preservation rarely found in regular rock, especially for insects. "There are many rock fossils from the Jurassic and Cretaceous periods, but they're limited to big animals like larger insects, mammals, dinosaurs, and birds, because small insects cannot be preserved in rock fossil very clearly. 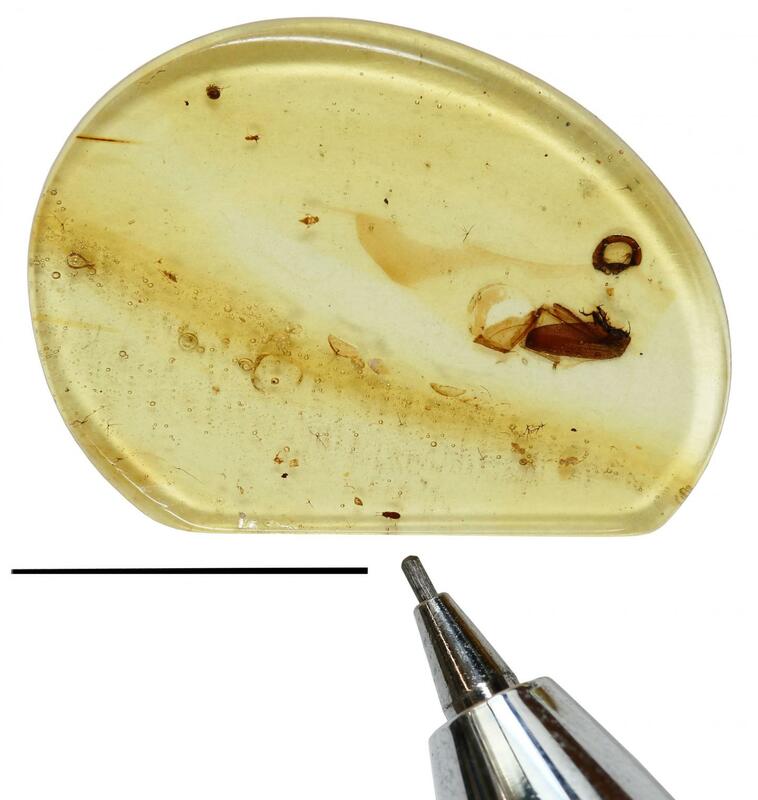 Only fossil insects in amber are preserved in fine detail, in three dimensions," says Yamamoto. Yamamoto looks forward to further discoveries of prehistoric animals preserved in amber. "It's likely that we'll find more in the future–Burmese amber is one of the hottest fossils in the world," he says. "There are so many great findings happening, literally day by day. Many important discoveries of insects will be made." This study was contributed to by researchers from the Field Museum, the Kyushu University Museum, the Canadian Food Inspection Agency, and the University of Tsukuba.